One of the world's largest superyachts, Serene, arrived in Auckland in the early morning of January 20. The vessel, owned by Russian vodka tycoon Yuri Scheffler, is the largest such vessel ever to visit New Zealand. Serene's visit was arranged by Asia Pacific Superyachts New Zealand and is viewed as a huge coup for support industry and luxury tourism. The firm‟s managing director, Duthie Lidgard reported APS NZ is providing services for the vessel during her stay. “She is now berthed at Auckland's Wynyard Wharf - the 134-metre Serene is too big for the dedicated big boat marina. 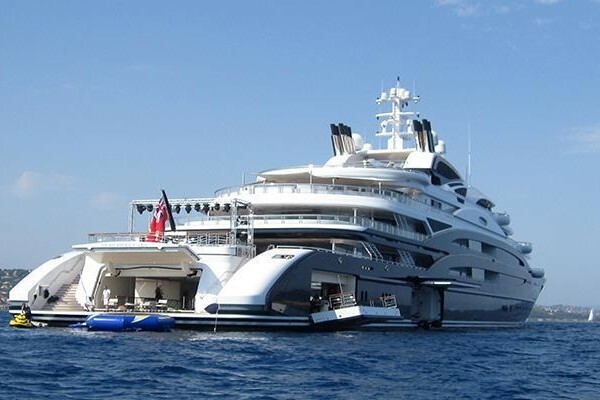 The $423 million Serene is the biggest superyacht to visit this country.” Serene is more expensive and 15-metres longer than the superyacht, motor yacht A, also owned by a Russian tycoon and the subject of intense interest during her stay in New Zealand last summer. With her full compliment of high-tech gear and watertoys onboard, Serene is the ideal luxury charter vessel. Providing support for M.Y.A during her visit, founding director of APS NZ, Jeanette Tobin, commented: "Getting such a high-profile vessel as M.Y.A to New Zealand was a coup for the superyacht support industry and for luxury tourism. Following superyacht A's stay her yacht managers spoke to their counterparts on "A" about their visit and plans then were made for Serene’s visit here." Jeanette said the busy Auckland Anniversary Weekend, Seafood Festival and busy cruise ship season created challenges finding space for the 8200-gross tonne vessel, which makes a splash wherever it arrives around the world. The Grand Cayman Islands-flagged Serene was built in Italy and launched in 2011 and reportedly took three years to build. The vessel has a helicopter hangar, two helipads and a submarine hangar. There is an underwater viewing space and 12 luxurious staterooms for 24 guests who are tended by up to 52 crew members. The owner's suite boasts an exterior hot tub on its terrace. This stateroom has a centred oversize California king bed, full walk-in dressing area and spacious ensuite bathroom. It has its own lift which links to a sea cabin on deck two, with a private swim platform. Behind the owner's suite are a salon, lounge bar and library with a fireplace. There's an internal seawater swimming pool, a hot and a cold Jacuzzi plus jet stream swimming pool on the sundeck. The vessel also has a cinema, a library and an indoor climbing wall for kids.Serene is one of the world's largest privately-owned superyachts and the largest to visit New Zealand. Serene is available for exclusive charter. Regarding the superyacht's visit, Jeanette said: "Spending by the party and crew during the visit will be huge - into the millions of dollars. It is likely to cruise around the coast but will be spending some time in Auckland. Other superyacht owners who visit enjoy the relaxed lifestyle and quintessentially Kiwi pastimes such as hunting and fishing." Offering concierge services to superyachts for the past 12 years, Ms. Tobin observed, "The tourism side of the business has boomed in the past year."